MJ Levy Dickson has been fascinated by elements of the ocean for many years. The artist's new body of work takes that fascination and turns it into a medium of awareness. Beginning tomorrow evening, the Graficas Gallery will feature her work in a week long exhibit. When author and educator Sylvia Earle visited the island and spoke at the Atheneum last summer, Dickson attended and said her perspective on the oceans and our effect on them was changed for good. The author of "Sea Change," Earle shares with her audiences the responsibility we have to protect the ocean, a message that Dickson now wants to share through her art. On the invitation to the upcoming exhibit she quotes Earle: "97% of the earth's water is ocean…that is where most of life on Earth is…it defines and characterizes the earth-one flowing body of water, with different names and climates, and covering almost 75 percent of the planet the oceans encompass 97 percent by volume of all the earth's living space…One has to concede at the outset that the ocean is too vast, deep, and secretive to be completely known," it reads. "The ocean is this vast mystery and we don't know that much about it," she said. "I always thought oceanography was a closed field…that is absolutely not true. Sylvia Earle essentially said it is a wide-open field and the more people are involved and study the ocean, the larger the impact, and this awareness can be used to possibly fund new research. She was very inspiring." Part of her inspiration has fostered a collaboration with two other island artisans, Alison MacDonald and Katherine Moore, who operate Ackfire Studios, a glass-arts studio in the mid-island area. "I've enjoyed Kathrine Moore's artwork and I have been interested in Alison's abilities to adapt her materials to the use at hand. When I saw her glass-making studio, I said ‘can we work on something together? '…this project seemed to be the right way to come together and I hope this is the beginning of many collaborations." The artists' collaboration over the past few months has spawned many glass creations of sea creatures, especially variations on jellyfish, the domed shapes found when they swim in the water, and the flat, distorted perspective often seen when they wash up on the beach. Made with a variety of different colored pieces of glass and fired to the inspiration of the artists, Dickson said this has been a time of great experimentation for her. 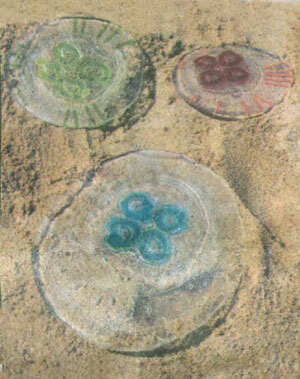 Other designs include large formations of "sea glass" that serve as an interactive sculpture of sorts, allowing the appreciator to create variations on the artists' ideas. "It has been great working with MJ," said MacDonald. "Working with glass we somewhat know the limits we work with, but combined with her (MJ's) ideas, we have been definitely pushing those limits. So we are excited to see what happens and where this goes." Over the past winter Dickson was the artist in residence at the Perkins School for the Blind in Watertown, Mass., and she recalled her trips back to the island and her observations of the jetties as the ferry entered Nantucket Harbor. There she saw seals resting on the rocks blending with their environment. 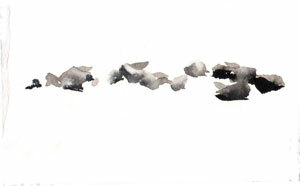 "I had observed the seals, but when you look at first, you don't always see them. I wanted to achieve that subtlety," she said. Working with charcoal, the artist found what she was looking for by observing the creatures and the rock formations around them. In addition to charcoal, Dickson is presenting works in watercolor and oil this season with elements familiar to those who know her work, and steps in new directions as well. "We move from what we know to what we don't know," she said. "I start with what I know and push in another direction, still incorporating the familiar with the new." Part of this new exploration is an experimentation with how water moves. "It is somewhat elusive to capture. The medium is dictating how I can describe the movement of water…Every day the water changes, so it is not something that is going to resolve itself," she said. In the future, Dickson wants each one of her exhibitions to incorporate an awareness of the ocean, and this time around, she hopes to encourage everyone to think about this vast amount of water that surrounds us and the ecological consequences of pollution. "As long as people remain aware that shells come from somewhere, seaweed and fish too, and people keep looking at the ocean for inspiration, it can lead to a better quality of life for us all. By making art and celebrating the ocean, I think that is the best contribution I can make at the moment," Dickson concluded.